There was a treasure-trove of new creatures discovered along the fertile Mekong River in Southeast Asia. 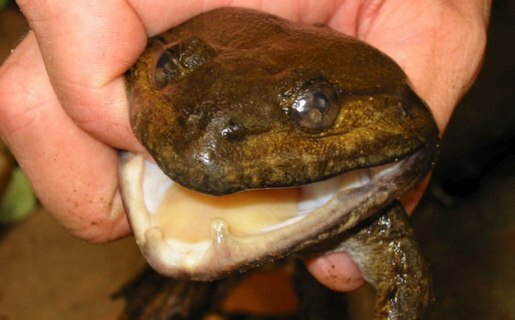 Among the 163 creatures are some pretty unusual animals, from the cat ba leopard gecko to the most fearsome frog on the planet, the Khorat big-mouthed frog. I call this frog fearsome for a reason. Not only is it an amphibian with actual fangs, it fights other frogs, dismembers its enemies, and has a particular appetite for tasty birds. It’s amazing how long some creatures take to be discovered, but then again, it’s pretty easy to walk past a lot of creatures. Animals tend to have great camouflage. For a creature like the Khorat big-mouthed frog, its chief weapon is surprise. It tends to lie in wait in the water until it spots something tasty coming in for a drink and then it snaps into action and captures its prey in its fanged mouth. Talk about a nightmare!